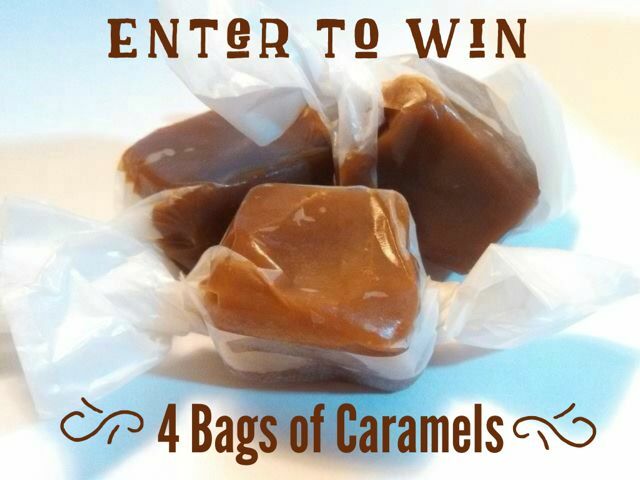 Enter to win these delicious caramels. Remember a few months ago when I got to sample the sweet, sweet caramels? Rain/Shine/Sweet was doing a Kickstarter campaign and they reached out to me with caramel. I am pretty picky about my sweets, because I don’t have a huge sweet tooth, so the fact that they won me over tells you a lot. I know I told you they were good, but what if you had a chance to try them yourself? Then you would know I wasn’t making this up. My favorite of the flavors was the chocolate. It tasted a bit like brownies and it brought back a childhood memory of these fudge caramel sticks we used to get as kids. To this day I do not know what that candy was, but I loved that this made me think of that happy memory. Take a minute to read all about this company and see why I was so impressed by them. This is a local company, that makes their product here, using 70% locally sourced ingredients. You won’t be disappointed in this product, I promise. Make sure you follow them on Facebook so you can watch for seasonal flavors. If you don’t want to take your chances of winning this, you can check Here to see what stores and Farmer’s Markets you can purchase these at. You can also purchase these online. If you want to try your luck and win these bags of goodness, leave a comment and let me know, will you share them or keep them all to yourself? As long as you are within the U.S. you can enter to win. This giveaway will close on Wednesday, Feb 12th at noon. Winner will be announced later in the day. This giveaway is now closed. Lisa E. you are the winner!!! My whole family loves caramel! My son will even beg us to put it in his milk. The chocolate and chocolate mint would be all mine, but I would be nice and share the rest…. With that many bags I would probably split them, especially with valentines day coming up. Nobody can resist Carmel! I would share, but sounds like it would be aged to do if they taste as good as you say!! Hard to do not aged!! I would share them with my kiddos. I love to sneak a little treat in their lunch bags. A little piece of yummy to let them know mom is thinking about them! I don’t think I would be able to share them…they’d be gone before anyone knew I had them!! Yum! Id share with friends. Yum! I would share them with my hubby and remember ‘home’…from Eastern Washington and have family in the Portland area. I would share. The more converts to yummy things the better. I would have to share a lil, my hub & kids love caramels!! These sound delish!! I love the Expresso Caramels the best…..try them? I would keep some for myself and share the rest. I would start off by sampling each of the five flavors, then divvy out to a select few, and then stash the rest away for later (private) consumption!!! I would love to keep these all for myself, but they sure would be a welcomed surprise for my kids’ teachers!!! Thank you for a SWEET giveaway!! ? I love love love caramels!! And I would share ? Sharing is my favorite!!! I’m a candy hoarder! I usually only give out one or two to my favorite people and keep all the others to myself! Selfish? This is one of those things that i would hide in the car or deep in the closet so that the kids don’t find them.im keeping them all for me!!!!!!! I would share them with Family and Friends so everyone would get a chance to try some wonderful caramels! These would be a great Valentine’s surprise for my husband! I would love to share these in the candy buffet at my upcoming BaByQ. Although since they’re not blue I may just HAVE to keep them for myself and the hubby! i will share em and would love to give a taste ! maybe your b-day month will be lucky for me as well !